The Environmental Protection Agency (EPA) is tackling the challenge of particulate matter contained in wood smoke from traditional wood stoves used for heating. While wood is a renewable resource that is typically abundant and inexpensive in northern areas, it can be a potent pollutant: its smoke contains particulates, carbon dioxide, and benzene, among other substances. New EPA regulations concerning wood burning heaters are expected to be reviewed in 2014 and enacted slowly over the course of five years to allow stove manufacturers to implement the changes in technology. However, today there are plenty of high efficiency options for wood burning heaters. 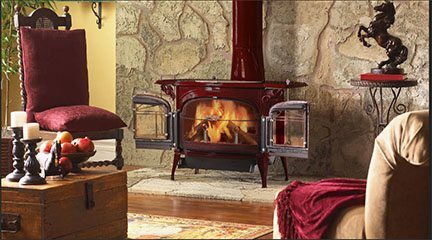 The EPA does provide ratings to stoves, and is an easy way to compare among several types of wood stoves. Stoves fall into two categories: catalytic and non-catalytic. Catalytic wood stoves use the catalyst to provide a secondary burn that makes a wood stove much more efficient, using less wood. Catalytic wood stoves are generally recommended for home owners who plan to use a wood stove as a primary source of heat in winter. They can be more expensive than non-catalytic stoves and require more maintenance. The catalyst unit will generally need replacement after five seasons, with regular routine maintenance ensuring a long life. Non-catalytic stoves are generally smaller, less expensive and used in secondary heating applications. Non-catalytic stoves are recommended for seasonal cottages and camps or as intermittent heat sources for a small area, such as a family room. They require much less maintenance and are easier to start, but are also less efficient, and as a result will consume firewood at a faster rate. One company, Vermont Castings, offers a Flex Burn® line of wood stoves (above right), which can operate in both catalytic and non-catalytic modes. These can offer a flexibility that many homeowners find appealing. Whatever the choice, you’ll be able to enjoy the warmth of a beautiful wood stove that will be more efficient and clean-burning.